Betorbet is an all-codes, all-year round backing service from the respected Phil Eadie. 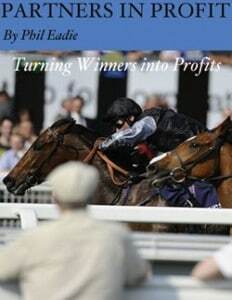 2013 sees the updated versions of his previously successful Partners in Profit betting strategy. The official title is actually Partners In Profit All Codes Edition For 2013, but we find that a bit of a mouthful, so we'll refer to the service as Betorbet from here on in! As alluded to earlier, Phil has refined, updated and amalgamated his previously successful strategies based on trainer/jockey trends and the value to be found therein. Now all codes - NH (summer and winter jumps), Turf Flat and All Weather racing - are together in one "no hype, no spin" package. Although the Betorbet blueprint was first published in 2011, Phil has been devising and constantly upgrading the results of his findings and is now offering the fruits of his seemingly sound and logical research at what appears to be a very reasonable £67* + VAT (£80.40) for the rest of the year. We will review all selections from the Betorbet strategy, reporting the results on a daily basis for the next 60 days. Our results will be declared as a £10 at betfair SP, less 5% commission from the winning bets, of which we're expecting plenty!